What is the date or pass game? Date or pass is a popular social game where other people reveal whether they would date you or not (pass). Date or pass is most often played on Facebook, but now other social networks (including Instagram and Tumblr), as well as some dating sites and even just forums and blogs with a large following have started to follow suit and introduce this game in different forms. How to play this game on Facebook? “Date or pass” or “date or pass and rate” can be used as a Facebook status. This should attract likes, which can then be responded to with date/pass and rated. Other times, the input can come without invitation. Here’s how it works: if someone likes any poster’s status, the poster can put on the liker’s page weather they would date them or pass up the opportunity to date them. The input can be given using typed words or emojis. A variation of the game that can be played on a forum: every next person after the op will post whether they would date or pass on dating the person above them. On a blog, in the comment section, visitors can post their statistics (height, age, eye and hair color, etc.) or even describe themselves (interests, occupation, etc.). 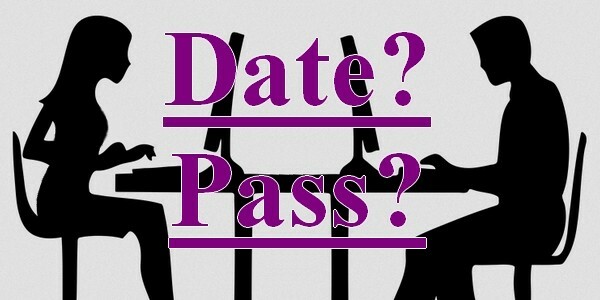 Other visitors can reply to the comment with a “Date” or “Pass”. “Date or pass” can be replaced with other degrees of attraction or repulsion. The popular ones are: kiss or diss, smash or pass, hug or ugh, hot or not, cute or ugly, etc. Date/pass can be a fun game to play, but unfortunately it can really hurt someone’s feelings. There is a video on YouTube of someone so frustrated with the rates and comments they received when playing this game that they broke down in tears… On the other hand, it can be a way to find new friends or just have fun and kill time. Let’s play a game! Post some information about yourself in the comments below and see weather others would date you!